What is the lifespan of eavestroughs? Typically Aluminum eavestroughs will last 20 to 25 years with proper installation. a) Eavestroughs are leaking at the corners. b) They may show signs of corrosion (pitting). c) Eavestroughs are falling away from fascia boards. e) Existing eavestroughs are the older nail and ferrule – with nails coming loose and falling out. What are the differences between aluminium and plastic eavestroughing? Aluminium is more durable especially for the weather in Canada. It is also a continuous piece of eavestrough so it reduces leaks, as opposed to plastic where you may have leaks at every seam. As well, there are no gaps between the aluminum eavestroughs and the fascia board, unlike plastic eavestroughs. You can fill out the “Get an Estimate” form on our website. Email us at info@reynoldsbros.ca to request an estimate. 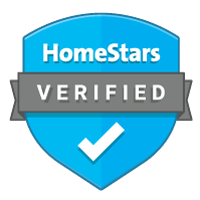 Look us up on Homestars.com, and after checking our reviews, request an estimate. Do you provide an itemized estimate? Yes, our estimates itemize everything simply in a list format, with separate line items so that it is clear exactly what each product cost. We provide this to you in a written or electronic estimate. Do I need to be home for the quote to be completed? No, generally you do not have to be home. You have 2 options. a) We can meet with you personally for your quote. We will walk around your home and go over the details regarding your water draining needs, soffit, fascia, siding or window/door requirements. b) We can also simply visit your property and walk the exterior of the home in your absence. Once complete, we email the estimate to you. We can go over the details of the estimate with you regarding any additional information or questions you may have. Do you subcontracted the work out? Many roofing and eavestroughing companies subcontract their work, however our commitment is to quality and customer service. We believe our quality control and a positive customer experience requires that we don’t subcontract. That being said, 99% of our work is completed only by our Reynolds Brothers Exteriors full time and WSIB insured staff. On the very rare occasion that we were to work with one of our trusted partners, we would make the homeowner aware of this fact. Does you install in the winter? Yes, our team does installation in the winter. We are a full time, year-round company which ensures that we don’t lose our great, quality installers during the winter months. As with the rest of the year, our team installs according to weather conditions to ensure that they are working in safe conditions around your home. There may be some rare occasions depending on home project needs when we will have to postpone an install till spring (ie: installation of dark colored fascia). A winter install will not affect the quality of the work or warranty provided. No, our focus and specialty is exterior aluminum work. This includes eavestroughs/downpipes, soffit/fascia, siding (vinyl), windows/doors and gutter guard systems. We let roofing companies focus on roofs. On the average home project, we do not require a deposit. Most of our installations only require authorization of the agreed upon work with payment at completion. We do however require a deposit for larger and more extensive projects and installations. Am I required to be home when the project is being installed? No, you are not required to be home, as we collect the necessary information related to your job during the estimation process, at time of job acceptance, and when booking your installation date. We request that all vehicles be removed from the driveway and parked either across the street or down the road, giving us ample room to work, as our installation equipment generally takes up a lot of space. Additionally, we make the long lengths of seamless eavestroughs on-site right from the installation machine in our trailers. Also, please ensure that any vehicles that you require the day of the installation are removed from the garage as the driveway may be blocked off and used as our team worksite. Please try to ensure that vehicles (trailers, boats, etc) are parked approximately 15 feet from the perimeter of your home to ensure that nothing is damaged during tear down of existing materials. Children and pets should be kept away from the job site, and we appreciate if animal feces are picked up prior to our installation. Keep in mind, we require access to your front and back yard, and to a working exterior electrical outlet. An average home can be completed in less than one day (weather depending). If you are having several different products installed (windows/doors, siding, eavestroughs, etc..), the installation will be take additional time. Do you take down and dispose of existing eavestroughs/materials? Yes, we tear down existing materials (old eavestroughs, siding, soffit/fascia, etc. ), and remove them from your property for proper disposal. We also ensure to clean the job site prior to our departure. Our aim is to leave the job and your home in the same condition as when we arrived once we’ve completed installation. Please note, that it is much more difficult for our installers to do a thorough clean up during winter installations due to the ice and snow, and expect to see some dirty snow and debris on your yard, after we remove your existing eavestroughs in the winter weather. I also need a new roof. Which job should I complete first? We recommend that you have your new roof installed prior to our work, as roofing ladders can cause damage to eavestroughs. However, depending on your needs, timing and urgency to complete the work we can complete the eavestroughs first if preferable. There are several professional roofing companies that have the knowledge to complete the work without causing damage to new eavestroughs. If you elect to have your roof installed first, please ensure that the new roof installation includes drip edge. Icicles are usually the result of poor insulation or ventilation (usually both) within your attic. How many times a year do you need to clean your eavestroughs? Eavestroughs should be cleaned at least once annually depending on the amount and types of trees you have surrounding your home. This can be practically alleviated by installing a gutter guard system. How do you stop eavestroughs from overflowing. Most times eavestroughs overflow because they are clogged and need to be cleaned (see above). You may also want to have them checked to ensure that they are straight and that there is no damage or sags in them. Do wet leaves stick to gutter guard? They will only stick temporarily. Just as they may temporarily stick to the hood of your car, leaves and debris that land on the surface of our leaf guard dry quickly in the sun. Unlike the hood of your car, the surface beneath the wet leaves on your eavestrough is perforated with holes so they dry faster! What happens when leaves and debris clog the eavestroughs? The Alu-Rex gutter guard system is the only system that we endorse. Without a gutter guard, leaves, ice and debris block the rain gutter and prevent water draining properly. When it rains, the water will seep into the house since it cannot evacuate normally. The prevention of ice build-up will enable your eavestroughs to last years longer. With Alu-Rex gutter guard leaves and debris can be cleared with a single gust of wind. The eavestrough cannot become clogged, and rainwater can fall through the perforation down your drainpipe.